Joshlyn Weaver has always lived with a big secret. Ordinary kids spend their free time going to the movies, hanging out with friends, and searching on the internet. But for her, an evening at home usually means entering people's dreams. For many generations, her family has been part of a very powerful and very secretive society of dream walkers. Tasked with the responsibility of lowering the world's general anxiety — which only leads to war and strife in the waking world — their job has always been to stop nightmares before they go too far. First Line:"The sewer wasn't the worst place for a nightmare, Josh Weaver admitted to herself as she fumbled with the boxy, rose-gold lighter in her hand." 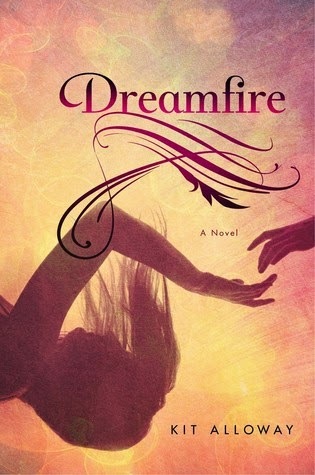 Review: Dreamfire was centered around well...dreams. Nightmares to be exact. There is a hidden society of people who call themselves Dreamwalkers that literally have access to enter into peoples nightmares and help resolve it. I found the whole concept of Dreamwalkers very interesting but I do have to admit that because of the in-depth sometimes tedious explanations of dream walking and dream theories the book dragged quite a bit, even with all the action scenes in the nightmares. Luckily I stuck to it because it picked up about half way through and I couldn't put it down after that. As far as the main character Joshlyn goes she was very gifted at what she did. Her skills in resolving nightmares is unheard of in the dream walking community. Joshlyn is living with a lot of guilt over the death of her boyfriend in which she blames herself for his death, so of course she doesn't know how to handle her new found feelings for her apprentice Will. Their romance was slow building which is realistic, unfortunately I didn't find any of the moments shared between them swoon worthy and maybe that had something to do with the fact that Will was just Will, there was nothing that made him standout to me. Anyways back to Joshlyn, I did find that there was quite a few times she acted before she thought her actions through which led to some pretty severe consequences to the people she loved and cared for so I didn't really like that about her but the girl was loyal and it was easy to feel her pain which made me easily sympathize for her. There are a couple of secondary characters that stood out to me. One was Windsor, Josh's best friend. I honestly hated her, she did something that no real best friend would do and I don't know how Josh tolerated her. Another character who I thought was just plain creepy until we learned the truth about him was Haley. He was the twin brother of Josh's ex and once we learn about his gift I found him to be one of the more interesting characters in the book. Overall even though the book starts of slow I'm glad I stuck with it.